Buddy and Tyler Byrd accept the Silver Shovel Award. A representative from Senator Joe Heck’s office stands to the far left. More than 100 excavators, locators, regulators and utility workers attended the NRCGA’s Nov. 3 annual Excavator Appreciation Event at the Henderson Convention Center. Highlights of the night included a BBQ dinner, lots of raffle tickets, and the announcement of the Silver Shovel Award winner. New to this year’s event was the NRCGA’s first-ever Locator of the Year award presentation. 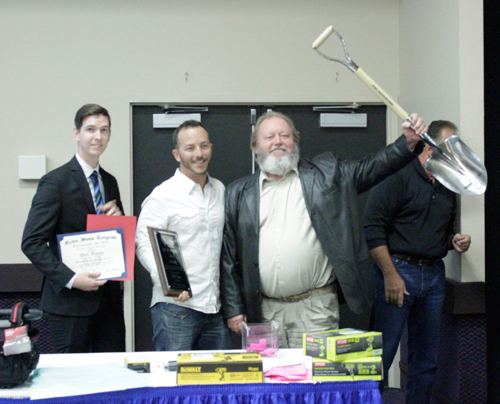 This year’s silver shovel trophy was awarded to Byrd Underground/Ditch Diggers. In addition to Byrd, the City of North Las Vegas was also in the running for the award. The City of North Las Vegas received a plaque for outstanding performance. Both Byrd and the city were nominated for the award by the NRCGA’s Silver Shovel Committee based on the number of new tickets called in by the organization and no at-fault damages between May 2015 and May 2016. Members of the NRCGA’s Board of Directors conducted in-person interviews with representatives of both organizations in Oct. to determine the winner. Byrd also received one free trip to the Common Ground Alliance’s March 2017 Excavation Safety Conference & Expo in Florida. Justin McCarger became the NRCGA’s first ever Locator of the Year and Brandon Soma received the NRCGA’s first ever outstanding performance award. Both McCarger, who resides and locates in the Reno area, and Soma, who resides and locates in southern Nevada, are employees of ELM Locating & Utility Services. Months prior to the event, the NRCGA asked eligible organizations with locate staff to submit applicants for the award. In order to be considered, a locator must have worked for the organization for at least one full year and have had zero at-fault damages between May 2015 and May 2016. Members of the NRCGA’s Board of Directors held in-person interviews with the locator nominees in Oct. to determine the winner. In addition to a silver belt buckle, McCarger also received a paid trip to Texas to participate in the 2017 International Locate Rodeo. To determine the 2017 Locator of the Year, the NRCGA has begun planning the first annual Nevada locate rodeo. For more information on the Nevada locate rodeo, attend the NRCGA’s monthly meetings or email info@nrcga.org. Robert Ward, NV Energy, welcomes attendees. Robert Ward, left, and Craig Rogers, Public Utilities Commission of Nevada, choose a raffle winner. Don Lomoljo, hearing officer with the Public Utilities Commission of Nevada, talks to the crowd about excavation safety. Colin Miyadi from USA North 811 educates the attendees about USAN’s one-call procedures. Excavators and locators enjoy the event. Craig Rogers explains the new process implemented by the NRCGA to select the first ever Locator of the Year award. Brandon Soma, left, and Justin McCarger. McCarger is 2016 Locator of the Year. The City of North Las Vegas’ Scott Durbin accepts the outstanding performance award. A representative from Senator Joe Heck’s office stands to the left. Ted Pistone, NUCA Las Vegas, stands to the right.